As seen in The Sunday Post, July 2018. You'll be £16.99 closer to your next £10.00 credit when you purchase Hidden Nature. What's this? Order within the next 3 hours, 8 minutes to get your order processed the next working day! This is a book about Britain’s wildlife, and how and where to find it. The aim is to show that you don’t have to travel to the nether reaches of the Arctic or the deepest corners of the Amazon rainforest to experience weird and wonderful creatures. They are right here, on our doorstep. You just need to know where to look! In a world where the natural world is slowly being replaced by technology and material things, every single one of us could do with appreciating the flora and fauna that exist on our tiny island. And that starts with spending time in the outdoors; exploring, searching and learning. Teaching ourselves that there is life beyond our laptop screens, and re-discovering our hidden nature. And this nature needs our help. Threatened by climate change, pollution and urban developments, we are losing our amazing wildlife at an alarming rate. But how are we meant to know what to save, if we don’t know what we stand to lose? How can we get passionate about conservation, if we don’t appreciate the wildlife we have at home? This is a guide to finding and appreciating the UK’s wildlife. Written by a young conservationist who refuses to grow up, it details her small adventures travelling the UK in search of wildlife encounters on a shoestring budget. Included are tips and tricks of the trade; advice on wildlife spotting, the best places to find it, and, where possible, how to encourage and conserve our native species. From ancient forests and coastal wilderness, to bustling city streets and your own back garden, nature is everywhere – if you just know where to look. 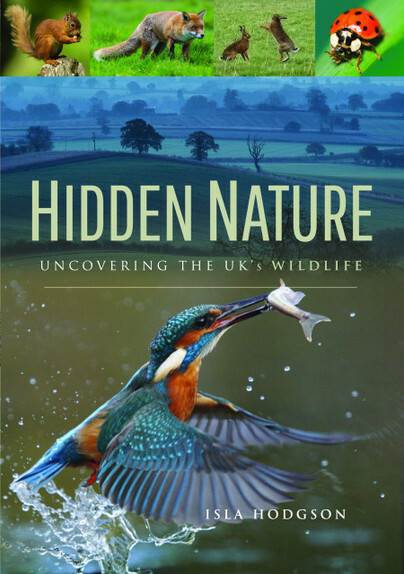 Featuring unique illustrations and photography, Hidden Nature will inspire you to get out there and discover Britain’s wilderness for yourself. I was lucky enough to win a copy of Isla Hodgson's 'Hidden Nature' and couldn't be happier. 5* customer service, fast delivery, well packaged and most importantly, a lovely book with lots of sharp and colourful photos. A refreshing read that is easy to dip into and get immersed in the vast array of Britain's wildlife -perfect! Written by someone who is clearly passionate about her subject. It is likely to appeal to those interested in ‘Conservation’ as a concept, those seeking advice as to what can be done to assist survival of endangered species, and to readers simply interested in learning more about the creatures which may be lurking in their own immediate area – ‘The ‘critters’ in the back yard’, if you will. Readers seeking beautiful photographs of British wildlife may also find it of interest. Hodgson is well known for her popular blog Where The Wild Things Live, and this is written in a similarly engaging and companionable style. The descriptions of her encounters with our most elusive animals - from seldom-seen cetaceans and sea eagles to hen harriers and hares - are fun and delightful, if a tad Scotland-centric. A lovely well written book with some beautiful pictures. Its split into four sections: coast, freshwater, inland habitats and urban spaces. Especially like the section on encouraging wildlife to your garden. Perfect gift for nature lovers. The love of nature can be found in every line. Detailed descriptions are rounded off with very great photos. Very educational and informative. Best of all, I found the passages, how and where you can marvel at the best of the kingdom. This beautifully illustrated book takes the reader on a journey with the author as she travels around the UK in search of native wildlife. The enthusiasm of Isla Hodgson seeps through the pages and you feel like you should hold your breath so you don't accidentally disturb the otters or the hen harriers which are amongst the animals she discusses in this book. There is a distinct 'Scottishness' to the narrative and none more so when discussing the 'coos' on Canna. This book is not a gazetteer as such but does contain a range of places you might visit to get closer to wildlife in a variety of habitat types, I think the sections on coasts are the standout ones - you can hear the raucous birds that live there and duck as the bonxies swoop down on us. There are a mixture of sites I had previously heard of alongside others that I might just have to look into. The book finishes with advice and guidance for seeing wildlife with some do's and don'ts as well as some ways to get involved yourself. The author clearly loves the wildlife she describes and if her intention is to pass on that love to the reader then she has certainly succeeded. Isla Hodgson is a Zoologist, wildlife journalist and freelance researcher for natural history film. She is currently based in Scotland, studying for a PhD in conservation conflict (essentially a big excuse for some adventuring). She has a strong passion for conservation, and her popular blog Where The Wild Things Live was born from a desire to spark that enthusiasm in others, starting with the wildlife we have at home.